$300 Cash Prize BlogExpose Blogging Contest! 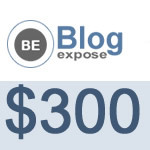 →$300 Cash Prize BlogExpose Blogging Contest! I’m excited to announce a blogging contest for BlogExpose.com. This will give users an opportunity to win $300 straight to paypal. There are going to be three winners and details are below. BlogExpose is a job board for bloggers from all over the world in any niche. There are different types of jobs to make money on the platform. While we are starting with writing jobs, in the near future, we will be adding more job types. If you are a company looking to hire bloggers for your business blogging or simply want to pay bloggers (with cash or free copies) to write about (review) your product, this is the right platform. If you are a vendor with an Affiliate Program, you can recruit bloggers from this platform to promote and earn special commissions. What if you want to do a contest and you need bloggers to take part, promote your product and earn cash? BlogExpose brings you the opportunity to announce your contest to a huge audience of select bloggers. To enter the contest, you simply should create a blog post about BlogExpose on your blog. Share your sincere opinion about it in 500+ words. Link to a BlogExpose Home Page or to the ‘How it works’ page. Make the link nofollow/dofollow. There is no specific requirement. The first and second winners shall be selected based on points. The contestant with the highest points gets the first prize. I want you to earn 10 points per new contestant who follows you to enter the contest. All you have to do is promote your contest post and tell your friends and readers to enter the contest. While submitting your contest post for review, you will have to enter the url where you learned about the contest (referral url). That’s how I’ll be able to know your referrals. If you are reading about this contest here for the first time, your Referral url should be this post you are reading. If you read it first on a friend’s blog, your referral url should be the friend’s contest post url. NB: If you submit your contest post for review without a referral url, I will minus 10 points from your total points earned. How the 3rd winner shall be picked! I want everyone entering this contest to stand a chance to win. So after selecting first and second winners based on merits, I will do a random selection to pick the third winner. So if you do not get the first or second prize, all hope is not lost. You can still be the third winner. There must be at least 20 entries before the winners are selected. If by the end of the next 30 days and there are no 20 entries, I will postpone the result date. Guest Crew is your business launch specialist. We store and buffer every social share: for example Facebook likes, tweets etc. and release them all, automatically – at the same time, on the due date of the campaign. Thus creating a huge buzz and possibly a trending hashtag about your business on the Social Media. What will you Promote Today? Start free right-away by creating your Business Campaign. WorthBlogger offers general blog ideas, content writing tips and other related topics that will help you stay informed online! The founder WorthBlogger is Jackson Nwachukwu, a seasoned professional blogger/writer whose work has been published on top industry blogs like JohnChow.com, ProBlogger.net, SearchEngineJournal.com, FreelanceWriting.com, BasicBlogTips.com and many more. A gift from Jackson to you! Click here to unveil it! The Bloggers Forum is an Online Community of Bloggers. Join Us to Learn, Share and Connect with Bloggers from Around the World Across Different Niches! We Talk About SEO, Traffic Generation, Blog Monetization, Content Writing and So On. Registration is Free! Join Us Today! A Top Class Online Business Resources & Inbound Marketing blog started in July 2010 for the purpose of providing quality tips, training, mentorship, which allows people & businesses to improve their income online, building successful online businesses and creating wealth legitimately. Looks like great giveaway. I will be participating in this contest. Thanks for the opportunity. I appreciate your initiative to promote Blog Expose. Of course, it’s a nice platform for bloggers to get paid. I’ll love to be a part of it. Good to hear this, just a wonderful way to enhance bloggers zeal. Am among the top bloggers to benefit from it. I would be happy to promote BlogExpose, that would be a cool way to earn online. Thanks for your concern in blogosphere. Am in, sir…. Have a nice day bro. This is a very great way of promoting BlogExpose, i am taking part of the contest and the referal URL is you blog! So you are back with another awesome giveaway! Well I’m gonna join the contest and wait for the results and I hope I’ll be the lucky winner. Best of luck to other participants too. Will be excited to receive it. Amended my post and made the entry. Thanks for that. Way cool idea dude. I like comments and referrals as the points to build your score. Engagement and word of mouth marketing, that’s where it’s at. You know I had to tweet this 😉 Thanks for the contest and may the best post win! Amazing Contest, I love the concept of your tool. I used the website for quite a while and it worked awesome. I’ll look forward to take part in this contest. Although it would have been better if there was assured gift. but My readers and I, speak french. how about the french bloggers ? It could be a pleasure for me to participate to the contest. Great Idea and great concept. Nice way to get paid. I am in for contest and ready to promote BlogExpose. Thanks for opportunity. Will have to check out blogexpose for getting help in supporting all our clients. Always on the look out for a great site that puts firms in direct contact with great talent to support amazing content creation. I think the competition just makes it all the better.